Sharmla Chetty is the Global Head of Europe & Africa for Duke Corporate Education. An innovative non-conformist with the strong commercial drive to see opportunities where others see challenges, her passion includes working in the area of corporate social responsibility and contributing to the development of female leaders. Sharmla is currently a member on the advisory board at the University of Technology of Tshwane Business School and a Board trustee for AVI Group of black shares scheme. She previously served as a non-executive director for Bigen Africa as well as on several board sub-committees including the Remuneration committee, Audit and Risk committee and as Chair of the Social and Ethics Committee. 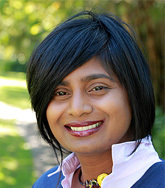 Sharmla is a finalist for Business Woman of the Year for 2016 in the Education sector, a fellow of the eighth class of the Africa Leadership Initiative-South Africa, the recipient of the 2016 Award for Entrepreneurial and Academic Excellence on the African continent, Chairperson of the BCG Development Trust and a member of the Aspen Global Leadership Network. As part of an Aspen fellowship programme, she has implemented the “Women Leading Africa Board Leadership – Voices of the Future” initiative building Pan African bench strength for women serving on board positions for Africa.